Foot pain? It must be plantar fasciitis! Right? Let’s start with the basics. Plantar means the sole of your foot. Fasciitis is inflammation of fascia. Plantar fascia is the fascia on the bottom of your foot. Fascia is connective tissue. The fascia on the bottom of the foot spreads from the heel to the toes. Its purpose is to provide arch support and absorb the force that is created from your foot hitting the ground. Got it? Good, but keep reading because there’s more. The name plantar fasciitis is a little deceiving. Once treated as an inflammatory condition, plantar fasciitis is now understood to be more likely an overuse injury, such as tendinous and collagen degeneration. The degeneration primarily occurs at the heel of the foot, so maybe a more accurate term for the injury could simply be “heel pain”. There are many possibilities. One can be a sudden change in activity level, like being a beginner runner or increasing your walking distance. Significant weight gain and the late stages of pregnancy are factors. Certain shoes, such as high-heels and rigid boots, can change the shock-absorbing quality of the plantar fascia. Hard ground surfaces factor mixed with repetitive impact loading of the foot, such as running or dancing, can also the culprit. Biomechanical factors, like overpronation and hypertonic muscles, are risk factors. A person who overpronates places more weight on the left side of the bottom of the foot during the gait cycle. 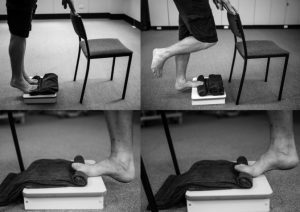 During overpronation, the dual responsibility of shock absorption shifts from the lower leg muscles and the plantar fascia working together to the plantar fascia doing most of the work. Ever get out of the bed in the morning, take a step, and immediately start limping from pain? Stabbing pain with the first morning steps is a common symptom. Usually that pain subsides but may return if standing and a lot of walking is done throughout the day. Common approaches to treatment may include a combination of orthotics, stretching, massage, and corticosteroid injections. Injections are helpful if actual inflammation is present; however, corticosteroids can eventually contribute to plantar fascial rupture. For some, foot orthotics or a night splint, which holds the foot in position, are helpful with reducing pain and increasing function . A 2014 study showed that high-load strength training to be an effective treatment. Photo courtesy of Running Physio. I bet you’re wondering when I’ll get to the good part- massage. While massage alone is not going to cure plantar fasciitis, soft-tissue techniques targeting any hypertonic lower leg muscles and the plantar fascia may help to reduce pain when combined with other therapies. A good place to start at home would be stretches that target the calf muscles and plantar fascia, as well as checking in with your healthcare provider. Your doctor or physical therapist can address your symptoms and prescribe the most appropriate training and treatment. Foot pain does not always mean plantar fasciitis. Too bad it’s not that simple. There are other possibilities to consider because they present with similar pain. One consideration is tarsal tunnel syndrome. The tarsal tunnel is a space on the inside of your foot beneath the malleolus (aka ankle bone). The tunnel houses lots of structures as they lead from the leg to the foot. One structure is the tibial nerve and when compressed or placed under high tensile stress, sharp pain can result. This pain typically hangs out around the tunnel and the inside of the foot and plantar surface. With tarsal tunnel syndrome, you may also experience numbness and weakness in the foot. Other possibilities include a stress fracture or ligament sprain to the foot bones. Speak to your doctor or physical therapist for an evaluation and treatment options. Acevedo JI, Beskin JL: Complication of plantar fascia rupture associated with corticosteroid injection. Foot Ankle Int 19: 91, 1998. ⟵Should I Cancel My Massage if I’m Sick?